Created in 2006 by Portland bartender Jeffrey Morgenthaler, Repeal Day is celebrated every December 5th by imbibers around the country to honor the repeal of the 18th Amendment in 1933, which ended thirteen years of Prohibition. The national celebration has grown in popularity year over year, and here in Los Angeles, bars across the city are once again featuring drink specials and events to help you party like it’s 1933. Cheers! Repeal movie clip is part of the Universal Newsreels collection. In honor of Repeal Day, The Varnish and Cole’s Red Car Bar are hosting the 4th Annual Jimmy Barella Bartending Competition on Tuesday, December 4th. 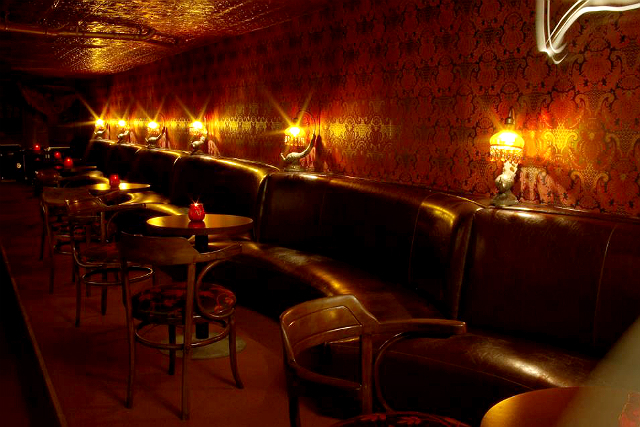 The competition honors the legendary bartender who held court at the Red Car Bar from 1918 to 1983. The first two rounds will take place behind closed doors at The Varnish. 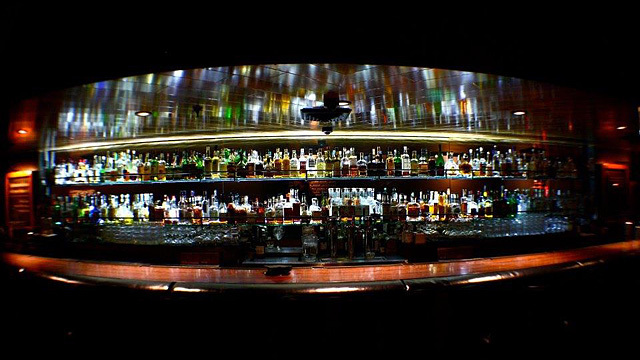 The final round will take place at Cole’s at 9pm, when two of LA’s top bartenders will go head-to-head and vie for the top prize of $500. The event features a live 3-piece jazz band, a Fernet-Branca Ice Luge, a Fernet toast at midnight, and a $5 Templeton Rye punch that will be available on December 4th and 5th. The festivities begin at Cole’s at 6pm, no cover. 1930s attire is encouraged. 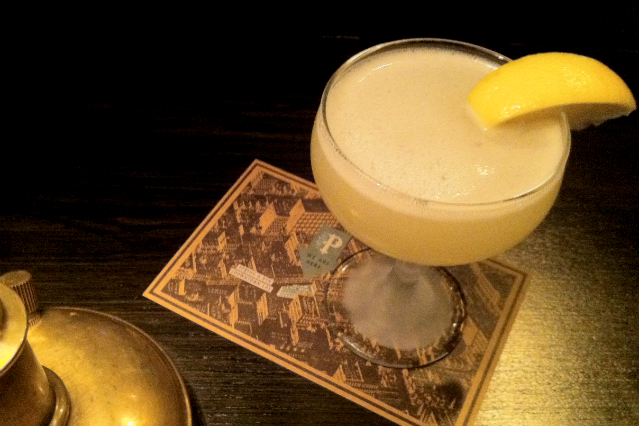 At The Parish, bar manager John Coltharp is featuring the Bee’s Knees, made with gin, lemon, and honey. The Bee’s Knees will be specially priced at $8 and only available on Repeal Day. 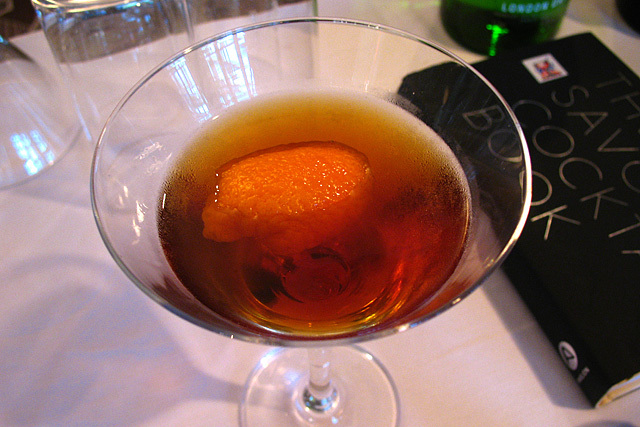 The origin of the drink is lost to history, but historians place its first appearance during Prohibition. The name of this classic sour comes from a 1920’s expression for the height of excellence. Honey was used instead of sugar to mask the bathtub gin. Thirsty Crow, Bigfoot Lodge, Bigfoot West, Oldfield’s Liquor Room will open at 5pm, Repeal Day Cocktail available from 5-10pm. La Cuevita opens at 7 pm, Repeal Day Cocktail available from 7-10 pm. Sassafras will be open at 9 pm, Repeal Day Cocktail available from 9-11 pm. 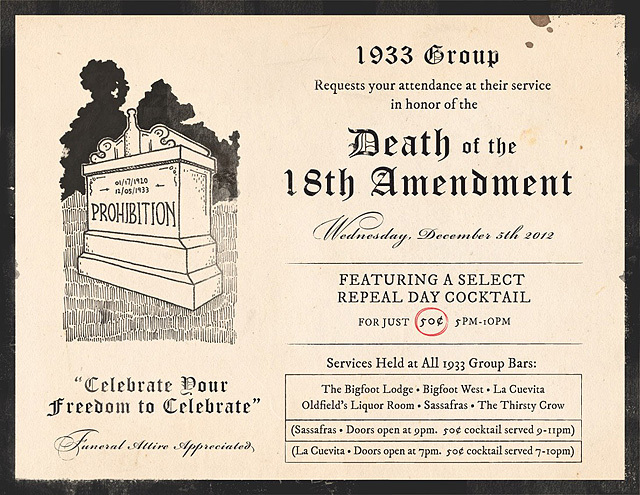 As if that weren’t enough, the Los Angeles Times and Liquor.com are teaming up for Spirits of the Times: Whiskey, taking place at Sassafras from 6-9pm on Repeal Day. The $20 ticket includes unlimited whiskey tastings, unlimited whiskey punches (including a chance to vote for your favorite), brand ambassadors offering their expertise, and small bites. If you want to celebrate Repeal Day “the Chicago way,” head to Big Bar on December 5th for a screening of Brian De Palma’s 1987 film The Untouchables, starring Kevin Costner and Sean Connery, in his Oscar-winning role. This Mini Movie Night will be an intimate set up on the South Patio, featuring a special outdoor bar serving cocktails with the ubiquitous Infinium Spirits (Carpano Antica, Fernet-Branca, Templeton Rye) and “eat-easy” foods like a 1930’s Blue Plate Special. Bartender Eugene Lee also mentioned something about Peanut Washed Templeton Rye Caramel Corn, which by itself should be reason enough to attend. 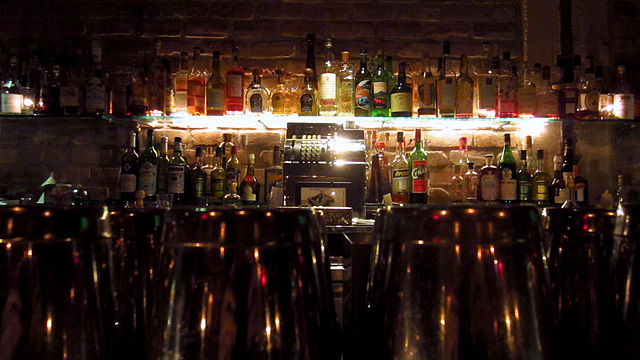 If you need more than booze to keep you warm, there will be plenty of heaters on full blast. Movie starts at 7pm, outdoor bar opens early. Limited seating, early arrival strongly recommended. Photo via the Neat Facebook page. Photo via the Townhouse Venice Facebook page. Rich Andreoli will be the guest bartender for the Repeal Day Pig N Punch bash at Townhouse and the Del Monte Speakeasy in Venice. Located beneath Townhouse on Windward Avenue, the Del Monte Speakeasy can legitimately claim (unlike most neo-speakeasies) to have been a true speakeasy, illegally selling hooch during Prohibition under the guise of selling produce as a grocery store. 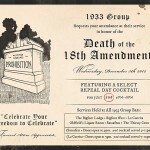 Celebrate Repeal Day with $5 Prohibition Punch, $8 Prohibition Cocktails and a free pig roast (‘til it’s gone). “1933 Pricing” will be in effect from 10-11pm, cocktails will be just $1. Venice Underground Comedy 8-10:30pm, Dustbowl Revival performs at 11pm. A new and somewhat unexpected entry in the Repeal Day festivities are the CHAYA Restaurants, which are toasting December 5th with a selection of $12 classic cocktails from December 3rd to December 9th at locations in Downtown, Beverly Hills and Venice. Cooperstown Cocktail (at CHAYA Venice): First appeared in The Ideal Bartender, originally published in 1917. Author Tom Bullock was a well-known bartender at the St. Louis Country Club, where his guests included prominent figures like G.H. Walker, grandfather of George W. Bush. CHAYA makes its version with Tanqueray Gin, vermouth, orange bitters and mint leaves. Sazerac is also available for $12. The Avenue (at CHAYA Brasserie Beverly Hills): Credited by Ted Haigh (Dr. Cocktail) to the Café Royal Cocktail Book, compiled by William J. Tarling and published by the United Kingdom Bartenders Guild in 1937. CHAYA’s take is made with Maker’s Mark, calvados, passion fruit puree and pomegranate grenadine. Corpse Reviver No. 2 is also available for $12. Hanky-Panky (at CHAYA Downtown): Created by Ada Coleman, the first Head Bartender of the famed American Bar at The Savoy Hotel in London. CHAYA’s version of her classic cocktail features gin, vermouth, Fernet-Branca, and maraschino cherry juice. Sidecar is also available for $12.